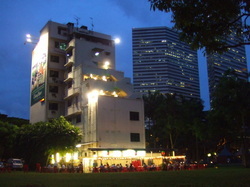 The Ophir Road site next to the Bugis subway station in Singapore has been vacant for several years. Despite the excellent location, it is rumored that the bad Feng-Shui arising from the sharp angles of the Gateway building by I.M. Pei on the opposite side is the main cause of the continuing emptiness. 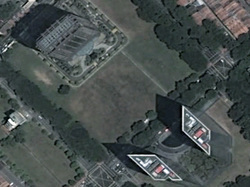 (2) The Urban Redevelopment Authority of Singapore’s participation in the “Marche International des Professionals de L’Immobilier” (MIPIM), an international property event in March 2008 that showcased this empty site further fueled speculations on the influence of Feng Shui among local developers who are reluctant to develop the land. (3) In 2010, the empty site was finally offered to the Malaysian government as part of an agreement to relocate the Malaysian government-owned Tanjong Pagar railway station to the new Woodlands Train Checkpoint. 2. Gwee, Kim Woon Peter. (1991). Fengshui: Geomancy and the Economy of Singapore. (pp. 67). Singapore: Shinglee Publishers. Noble, Sarah. (1994). Fengshui in Singapore. (pp. 48). Singapore: Graham Brash. The splintering of the urban landscape by road, rail and highway networks have given rise to islands of undefined and empty spaces in many contemporary cities. In densely populated cities such as Bangkok, Tokyo and Hong Kong, the high demand for spaces to support daily activities resulted in such interstitial spaces being reclaimed by urban dwellers for their individual and collective uses. These empty islands are also favorite places for the homeless to seek temporary shelter. 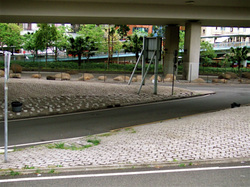 The ambiguity of these forgotten spaces offers a degree of invisibility to the homeless in the urban landscape. I have used this narrow stretch of land as a route to the top of the hill since a teenager. 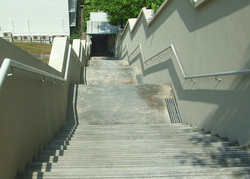 During that time, the stair was a series of makeshift steps constructed to facilitate public access. When the new private residential development was built recently, the space was designated as a public right of way as a result of the easement law. 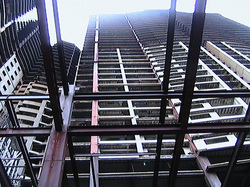 The developer was not allowed to build in this space, except to continue with the provision of a public access. 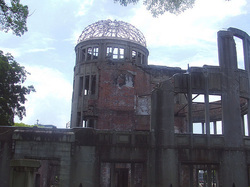 The physical and haunting emptiness of the A-bomb dome in Hiroshima stands as a lasting symbol of the devastation caused by the atomic bomb during the Second World War. Its absence of any practical use is replaced by a symbolic role and as a memorial to those who have perished in this horrific bombing. Emptiness becomes a repository of memories. 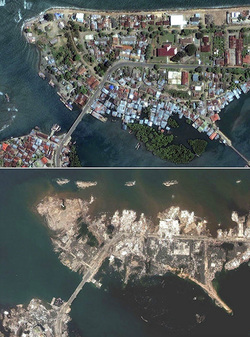 The 2004 Boxing Day Tsunami, which was caused by a massive 9.1 magnitude earthquake centered off the western coast of northern Sumatra created widespread death and destruction to the coastal towns of fifteen cities in Asia and as far as Africa. (7) The emptying out of buildings and lives was played repeatedly over international news channels via television and the Internet. A facet of our modern-day lifestyle is the regulation of our everyday by the clock, which sets the time for work, rest and recreation. 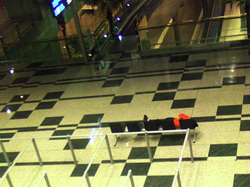 The quiet and tranquil empty airport lounge and subway stations in the early hours of the morning, emptied of frenzied passengers and commuters are two contemporary examples of how chronological time alters our perception of spaces in the city. Seasonal transformation of a place such as a park, from summer to winter exposes different atmospheric qualities due to the absence of human occupations, flora and fauna as well as the emptied out of colors by the snow.